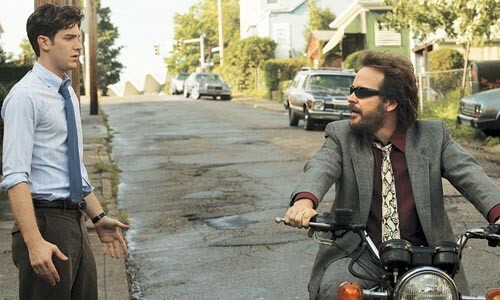 Jon Foster and Peter Sarsgaard go for a ride. Among the mysteries we've been kicking around the past year or so: Whatever became of the film version of The Mysteries of Pittsburgh? It was shot here in 2006, with much fanfare and a generous slate of amusing faux pas from the film's starlet, Sienna Miller. Then, like one of the promising young people the work celebrates, the film simply left town and never came back. It popped in for a one-night stand at last year's Three Rivers Film Festival -- sold out! -- and after finally securing a distribution deal, settles in this Friday for a theatrical run. But while absence may have whetted our anticipation for a reunion, there's no escaping the fact that this film is a rather lackluster visitor. Director-screenwriter Rawson Marshall Thurber adapted Mysteries from the 1988 coming-of-age novel by University of Pittsburgh graduate Michael Chabon. Thurber's previous film was Dodgeball, an unabashed comedic celebration of being hit with a hard ball repeatedly. And it seems that as much as the world needs yet another crass comedy about people falling down, it also needs repeated portrayals of sensitive young men learning life lessons. I read the novel too long ago to recall how accurately the film captures the material. I can tell you that the much-discussed "cloud factory" has been bizarrely relocated, and that some characters have been combined. Mysteries is now basically a five-person story: a central love triangle, plus a mostly out-of-town daddy and a boss-slash-bed-buddy. The summer of 1983 stretches before Art Bechstein (Jon Foster), a recent college graduate who's still cooling his heels in the Steel City before taking up stock-brokering at the behest of his gangster dad (Nick Nolte). Out of boredom, he's sleeping with his boss (Mena Suvari) at his menial bookstore job. That is, until a pretty-people party introduces him to the impulsive, beautiful rich girl, Jane (Miller), and her rough-edged but irresistibly roguish boyfriend, Cleveland (Peter Sarsgaard). A few boozy nights later, Art's crushin' on both Jane and Cleveland, and the feelings seem mutual. A once-dull summer is now a certified-cool reel of youthful kicks: skinny-dipping, dressing up for fancy dinners, sunbathing at shuttered steel mills, punk-rock shows, road trips, bed-hopping and -- this never gets old -- getting caught in the rain. If you guessed that the emotionally, and physically, intoxicated Art is both losing his way and finding himself, you'd be right. Rather than engage, Mysteries just drifts by, treating its underdeveloped protagonists as mere acquaintances. Other than their surface charms (and our immediate recognition of their cinematic types), we don't learn why Jane and Cleveland are so compelling. Art's passivity is part of his stagnation, but as viewers, we don't get much sense of his struggle. His weightiest burden -- his dad is not just overbearing but also a career criminal -- seems more like a bad plot device than an ongoing tragedy. So, Mysteries is back in the 'Burgh. But like a long-gone friend with whom one enjoys a pleasant if dull sojourn, it's less likely to be noted for itself than for the tangential, more lively discussions of the past it stirs up: "I liked the book"; "Remember 'Shitsburgh'? "; and "Hey, I forgot Modey Lemon was in this."